Studies in catalyst deactivation play a major role in the identification of the real catalytic system, in particular, the structure and texture of the solid, which is often in a metastable state, as it is operated in the industrial reactor. These studies also allow the identification of the experimental conditions which preserve this active and selective state. This is crucial for a real understanding of catalysts and catalysis. Another area of catalytic science concerns reactions kinetics, which, if properly determined, are of paramount importance in the elucidation of mechanisms. The behavior of the kinetics during aging and deactivation and an accurate modeling of the evolution of activity and selectivity are essential information for the process performance. These are just two typical examples, but quite generally, the science of catalyst deactivation is going to be more oriented to fundamental issues. 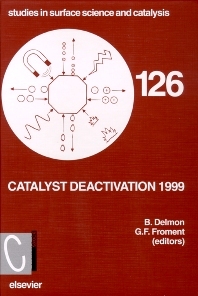 For scientists and industrial chemists concerned with catalyst deactivation.